Like all other records, death certificates are prone to error from many sources, some of them human. Frustrating as that is in genealogy, though, the reasons are the same as with birth and marriage certificates, but there are always some particular circumstances - and possible ways around them. There are always deaths where no name can be attached to the deceased, often people who are homeless or desperately poor, as it has been throughout the ages, and possibly always will be. Other deaths, by their nature, end up being registered without a name, following natural disasters, or catastrophes where identification becomes impossible. There have been times, however, when the registration of death was quite complete. For the first decade after 1837, officials believed they'd registered 98% of all deaths, a huge boost in genealogy. Where possible, the law decreed that the death should be registered before burial, but that wasn't always done, meaning some deaths went unregistered. A death will normally be registered in the district where it happened (there are some exceptional circumstances, but they're few and far between), rather than where the deceased lived. So, in order to discover the death certificate, you'll need to know where it happened to fill out your family tree. You might be surprised that more than one possible death with the same possible name is a relatively common problem in genealogy, especially if the burial and probate records don't pinpoint the date. At that point you'll need to give the registrar more than just the name and rough age of your ancestor to distinguish between possible death certificates (generally you'll need an address or maybe the name of the informant), and the registrar will verify for a fee. Before 1874, when medical certificates were not necessary for a death certificate, there were very rare instances of a death being registered twice, which can create confusion in genealogy. This generally happened when a coroner was involved, and one of the reasons could be the coroner's office sending the information to the wrong district. 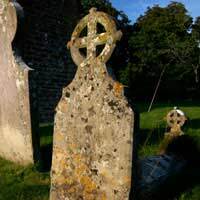 Church burial records are a good source for discovering deaths in your family history - until the Second World War, burial was the main for of interment, and one usually preceded by a funeral. Until 1813 burials were registered in the same books as baptisms, but after that were kept separately, a point worth remembering in a genealogy search. With the advent of forms for burial entries in 1913 things became more standardised, and the Federation of Family history has been indexing these county-by-county. You should be aware that many, up to half, of the burials were from children who'd died. One thing you probably will need is a great deal of patience unless the register is well indexed, and not all are, by any means - indeed, in genealogy patience is a real virtue. Perhaps the best thing is to assemble your clues prior to searching, and try and make deductions about possible dates of death to try and keep your search small.